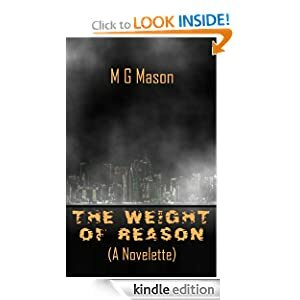 The Weight of reason is a short story/novella written by MG. Mason featuring a detective cyborg in a futuristic London filled with criminals and hard times. Apparently crime is rampant in Skara Brae Oceanic so Private Detective Trant a cyborg (half human half robot) is called to the scene of a crime where a person was nearly beheaded. The crime is followed by several other “otters” or people who are enhanced to work underwater who speak of a type of climate change. The book has wonderful scenes vividly depicting a single Private Detective trying to get by and rather well in a place otherwise riddled with crime and illegal selling of goods. It shows how corporation after corporation try to fix the poverty that befell London with only the opposite effects. The read was quick (took me about 20 minutes) and formatting was good to excellent. My only quirks of the novella was the undertones that all corporations are big and evil. It did show a very accurate description of the average “commoner” inhabiting London. 4.5/5 Despite the liberal undertones I fairly enjoyed the sci-fi crime plot that read smooth and wasn’t “cookie cutter.” Well done Mr. MG. Mason.